While video quality has improved dramatically over the years from standard-definition to high-definition and now 4K Ultra HD, digital audio effectively peaked with the introduction of 24-bit, which most experts agree matches or exceeds the limits of what human beings are capable of hearing. Regardless of how far audio bitrate depths climb in the future, the far greater challenge is creating a recording free of defects in the first place. As anyone who’s attempted to record sound outside of a controlled studio environment will tell you, that’s nearly a daunting, if not downright impossible, task. It’s also why an entire cottage industry has sprung up to create software products that help reduce or eliminate these kinds of unwanted noise. One of my longtime go-to favorites is SoundSoap, which was resurrected in 2013 after original developer Bias went out of business a year earlier. SoundSoap 5 retains its familiar user interface, but adds support for MP3 and FLAC, audio metering, and improved hum removal. SoundSoap 5 marks the third major release from new owner Soundness, and the first to introduce a three-tier strategy for cleaning up noisy audio files. A standalone Mac App Store version ($80) performs the core task of eliminating background noise, clicks, pops, hum, and hiss from popular audio file formats like AIFF or WAV; the latest version adds MP3 and FLAC to the mix. There’s also a version priced at $149 available directly from the company’s website which adds the ability to use SoundSoap inside other applications that support AAX (64-bit only), AudioUnit, or VST plug-ins; popular host software includes Final Cut Pro X, Logic Pro X, Adobe Premiere CC, and Pro Tools. 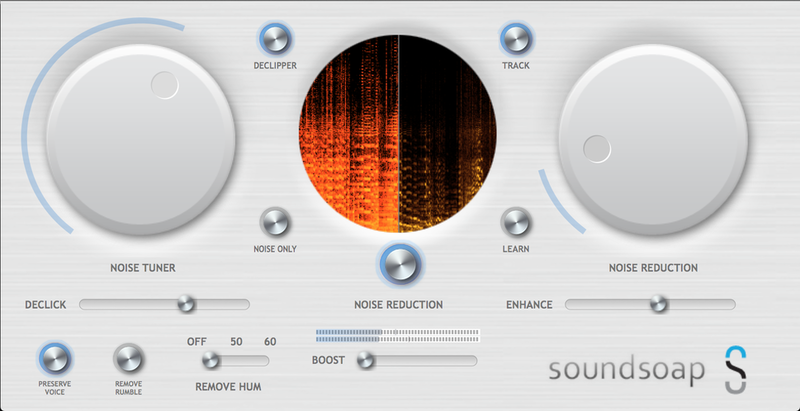 Last but not least, there’s a new high-end offering called SoundSoap+ 5 ($249), which is the version I’ll focus on. 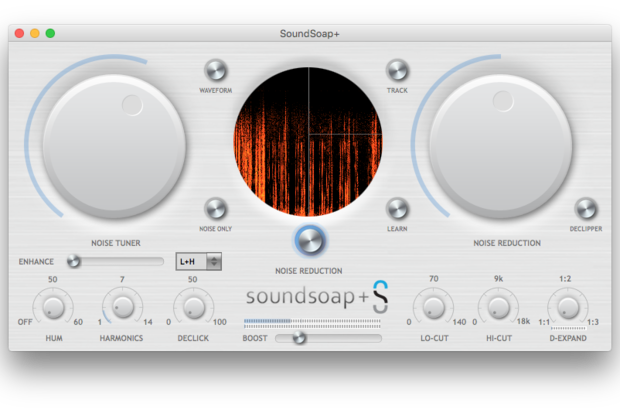 No matter which one you choose, SoundSoap 5 is remarkably easy to use, and fairly automatic in typical use. While playing a section of audio containing the noise you’d like to eliminate, click the Learn button. The software intelligently analyzes the unwanted sound and removes it without requiring the end user to have a degree in audio engineering. SoundSoap+ 5 adds preset control to the Enhance slider for improving the low, mid, and/or high ranges of any audio file. While SoundSoap’s automatic noise detection alone is impressive, those willing to experiment a little more can produce even more impressive results. Large virtual knobs for Noise Tuner and Noise Reduction can be turned to tweak what’s being filtered, and there are sliders to restore life to the clean audio (Enhance) or eliminate pops and clicks (Declick) from analog recordings. If audio was recorded too loud to begin with and suffers from clipping, there’s also an option to help smooth that out as well. SoundSoap 5 introduces high-resolution audio meters, a welcome addition that works in tandem with the Boost slider to increase the overall volume of the processed sound. In the previous versions, a spectrum-based visual reference of incoming audio appeared in a circular Wash Window in the center of the window, but SoundSoap+ adds a new Waveform option as well. This comes in particularly handy for accurate placement of the vertical red indicator when using the Learn tool on the standalone version, but there’s still no way to play sections in a loop or zoom for greater detail. Waveforms also come into play when working with QuickTime files. In previous versions, the SoundSoap application displayed only video in the Media Window, but there’s now an option to view audio waveforms instead. 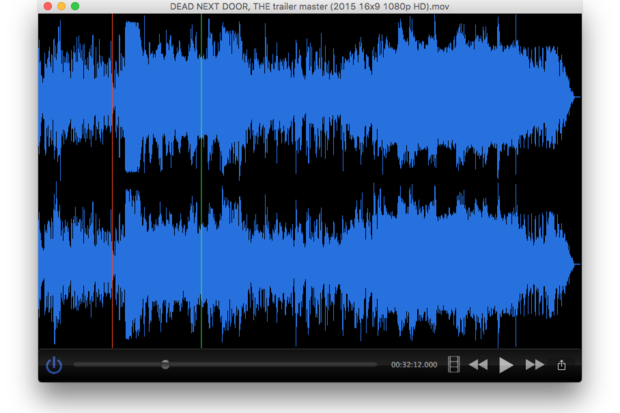 While this is a step in the right direction, I’d like to see the developers go all the way by allowing picture and waveform at the same time, but for now the Waveform view in the Wash Window will have to suffice. Being able to view audio waveforms for QuickTime videos is an improvement in SoundSoap 5, but I’d prefer the option to see both at the same time. Although the regular versions are more than enough for consumers, the new SoundSoap+ 5 provides additional control over the audio restoration process that will definitely appeal to more experienced users. For starters, the Enhance slider has been relocated to the left side of the window, and now includes a submenu with six presets for control over low, mid, and high audio ranges. The Preserve Voice, Remove Rumble, and Remove Hum buttons have been replaced with virtual knobs for Hum, Harmonics, Lo-Cut, and Hi-Cut which offer independent, granular control over the processing; the Declick slider has similarly been converted to a knob. While this change is understandable, I prefer the simplicity of the one-click options for quick adjustments; thankfully, these options remain available as individual parameter sliders when using SoundSoap+ as a plug-in within supported host software. Last but not least, the new D-Expand (Downward Expander) adjustment provides compression to further help reduce audible noise below a certain level. The Threshold level itself is set by clicking on the Wash Window while in Waveform mode, then moving the mouse up or down. It’s a powerful new tool in the SoundSoap arsenal, but requires a fair amount of manual adjustment to get just right. The new higher-end SoundSoap+ 5 substitutes one-click processing options for granular controls over audio noise reduction processing. Soundness has really knocked it out of the park with SoundSoap+ 5, an ambitious new version that offers more powerful audio restoration controls while breathing new life into the existing tools.